Brenthaven Collins 1951 Notebook Carrying Backpack 15.6 Inch - GraphiteThe Collins Backpack offers the capacity and functionality of a laptop backpack in a low-profile silhouette with protective pocketing throughout. Differentiated by its unique exterior fabric, vegan leather trim and metal accents, the Collins Backpack accommodates laptops up to 15.6 inches and packs a visual punch. The backpack wins on functionality as well, featuring a highly protective side-access laptop compartment, easy access phone pocket, and lots of room for storing all of your mobile devices and accessories. Pair this backpack with the Collins Laptop Sleeve for added device protection. 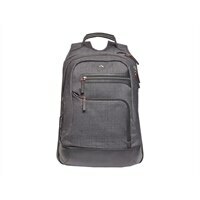 The Collins Backpack offers the capacity and functionality of a laptop backpack in a low-profile silhouette with protective pocketing throughout. Differentiated by its unique exterior fabric, vegan leather trim and metal accents, the Collins Backpack accommodates laptops up to 15.6 inches and packs a visual punch. The backpack wins on functionality as well, featuring a highly protective side-access laptop compartment, easy access phone pocket, and lots of room for storing all of your mobile devices and accessories. Pair this backpack with the Collins Laptop Sleeve for added device protection.